SAN FRANCISCO — Realtor.com, the official consumer website of the National Association of Realtors, is experimenting with an agent matching tool that helps consumers evaluate and choose agents based on their multiple listing service stats like number of recently sold homes, list-to-sale-price ratio and average days on market. The “AgentMatch” tool, which has been in beta in Las Vegas and Boulder, Colo., since August and is focused on sellers at the moment, brings consumers to the highest-performing agents online based on MLS stats, realtor.com President Errol Samuelson told a crowd at the National Association of Realtors’ annual convention. Thanks to its relationship with NAR as the trade group’s official consumer website, realtor.com enjoys direct data feeds from more than 800 MLSs across the U.S., representing 98 percent of all MLS-listed properties for sale nationwide. When consumers choose a city, ZIP code or neighborhood on the AgentMatch site in the two markets at agentmatch.realtor.com, they are presented with MLS data summarizing the area of their selection and a gallery of highest-performing agents who have sold a home in their search locale within the last six months. 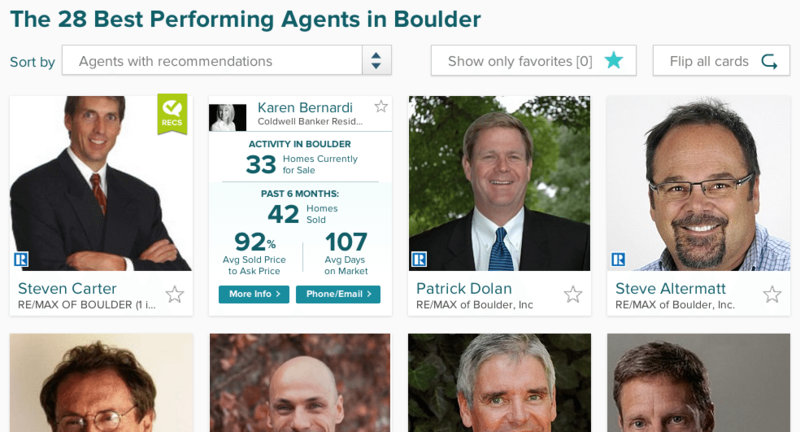 Screen shot of search for agents in the Boulder, Colo., market using AgentMatch. The site surfaces the top 28 agents by city and 16 by ZIP and neighborhood searches. The AgentMatch algorithm ranks agents according to their MLS stats in the search area — number of active listings, number of homes sold in the last six months, average list-to-sale price and average days on market — presenting the 16 agents with the highest rankings. The rankings are objective and the portal’s actively tweaking the rating system’s algorithm, Samuelson said. Currently, there’s no advertising associated with the tool. Linking consumers and agents via the Internet is an opportunity with a lot of white space, Samuelson pointed out, highlighting data that showed that only 9 percent of homebuyers or sellers found their agent online, and just 4 percent of agents generated more than half of their business on the Web. Until recently, an offering like this from realtor.com, which Move Inc. operates under the terms of a 1996 agreement with NAR, might have been impossible. A 2010 amendment to the agreement included wording allowing Move to display Realtor productivity statistics such as active listing counts and sold transactions, but only when listing brokers signed off. NAR also retained the right to grant final approval over adding that capability to the “Find a Realtor” tool. The 2010 amendment also required NAR approval for display of consumer evaluations or ratings of Realtors. In July, NAR and Move, reacting in part to realtor.com’s shrinking market share relative to Zillow and Trulia, revised the realtor.com operating agreement again to give Move additional leeway to run the portal. Some of the changes allowed the portal to now include new-home listings, rental listings and others from non-Realtor sources. When the Houston Association of Realtors briefly offered a similar “Realtor Match” tool in the spring of 2010, agents objected so strongly that HAR was forced to disable some of the most advanced capabilities after only a few days. HAR continues to offer an agent ratings tool that agents can opt out of, which allows past clients to rank members using a five-star rating system. Seattle-based brokerage Redfin also tried launching an MLS-based agent matching tool in 2011 in 14 markets and a section of Atlanta. The brokerage pulled the plug on the tool a week later, citing on concerns that rating agents solely on MLS data created an incomplete picture, especially in the case of agents who work informally on teams, or with out-of-town agents. Last year, Google-backed HomeLight launched an agent matching referral site in 34 markets based on agent transaction data. It has hit a snag in two of those markets — in Seattle and California’s Central Coast — where the local MLSs say that their data is not used legitimately on the site and have demanded it be pulled down. The referral site NeighborCity has faced years of ongoing controversy — including lawsuits from MLSs that allege the firm accessed their data illegally — stemming from its efforts to jump-start an agent matching site that gives consumers insights into agents’ transaction histories and metrics. Zillow and Trulia feature agent profiles, too, with past and current sales info the agents input. To see how the approaches differ, compare Boulder-based agent Patrick Dolan’s AgentMatch profile with his profiles on Zillow and Trulia. Dolan has a separate realtor.com profile that’s different from his AgentMatch profile. The AgentMatch profile shows more detailed MLS data, focused on the consumer’s search area — whether city, ZIP or neighborhood — and data narrowed to the last six months. Since the data for “third-party” portals like Zillow and Trulia is often not linked to an MLS feed, agents will have inaccurate or incomplete information if they fail to update their profiles themselves. Adding to the confusion, sometimes MLSs tally listings and sales differently than agents do. The discrepancies in the number of active listings in Dolan’s profiles on Zillow, Trulia and realtor.com are an example of the confusion born from having data flow from multiple sources. His Zillow profile notes he has 14 active listings; his Trulia profile notes 37 active listings; and his realtor.com profile shows 17 active listings. Those differences among Dolan’s different profiles were not unique to him, with some profiles more consistent than others; and, at the moment it’s not clear which portal’s profiles (or its data) consumers will end up trusting more and why. But realtor.com is clearly making a push to be the go-to site for agent info. 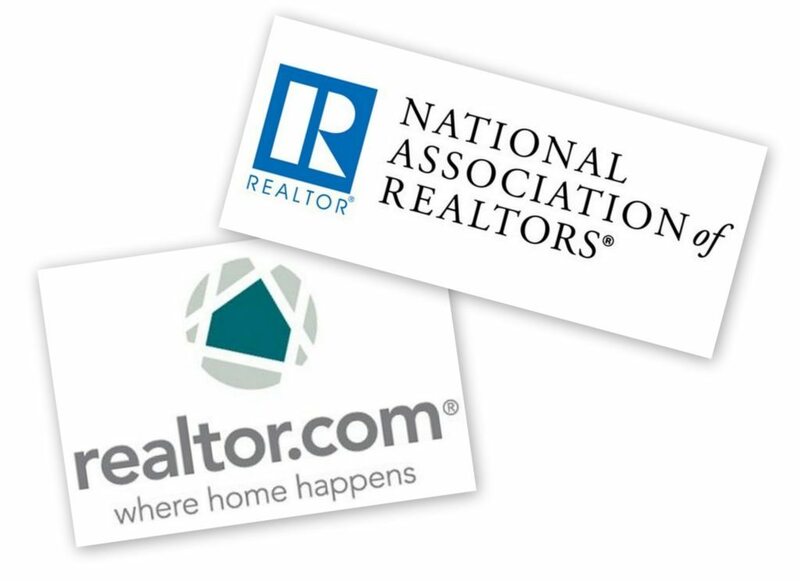 Earlier in the week, NAR CEO Dale Stinton emphasized the trade group’s commitment to realtor.com as its consumer website, which is currently in a fight for its life with Zillow and Trulia for market relevancy. This year, realtor.com has been holding on to the No. 3 spot behind Zillow and Trulia as one of the three most visited real estate-related websites from desktop computers. In October, its 6.72 percent market share dropped it to No. 4 for the first time this year, behind Zillow-powered Yahoo Homes’ 6.72 percent market share, according to Experian Marketing Services data. Portal January 2013 % Web market share from desktop computers October 2013 % Web market share from desktop computers Difference from Jan. to Oct. Since January, realtor.com has lost Web traffic market share to Zillow and Trulia. Zillow, which has spent heavily on marketing this year, has made the biggest gains. From January to October, realtor.com lost 4.63 percentage points of Web market share from desktop computers and 3.04 percentage points of mobile market share (excluding traffic from mobile apps) to Zillow, according to Experian. Currently, Zillow generates more than twice the number of visits to its site from desktop computers than realtor.com and four times from mobile devices, according to Experian. Portal January 2013 % Web market share from mobile devices* October 2013 % Web market share from mobile devices* Difference from Jan. to Oct.
Trulia and realtor.com’s market shares were closer on desktop computers in October. Trulia had just above 7 percent more Web traffic than realtor.com in October, but more than 70 percent more traffic from mobile devices. Realtor.com says that it attracts higher-quality traffic, attracting consumers who spend more time on the site and who are actively looking to buy a home instead of just looking. Trulia makes similar claims. Zillow’s response might be implicit by touting its more than 60 million unique visitors per month. The focus on putting Realtors front and center in online lead generation is emerging as a strategic play by realtor.com, shifting the convention of lead generation tied to listings. “Rather than listing agents by advertising or promotional incentives, we leverage statistics and data from realtor.com to identify listing agents that have a history of selling homes faster and for more money,” a portion of the “How it Works” section on the AgentMatch site reads. Zillow, Trulia and realtor.com currently sell advertising to agents by putting them next to listings. On Zillow, for example, agents can buy a certain percentage of consumer impressions in a ZIP code. Many of those impressions come when a consumer looks at a listing detail page and sees up to four agents and their contact info displayed prominently on the screen’s right. Trulia has a similar model. Last week, Move and realtor.com took another step toward its goal to bring agents to the forefront of home search with the launch of its agent profile manager SocialBios out of beta with integrations with LinkedIn and RealSatisfied reviews and a software tool that helps agents broadcast the profile on other platforms. Shifting the starting point of a consumer’s connection with an agent from the real estate listing to an in-depth SocialBios profile is “my dream,” said SocialBios founder and head of Move’s social product and development Ernie Graham. That goal merges with realtor.com’s “fundamental mission to make the Realtor successful,” as Samuelson reminded the crowd at the beginning of his talk. In March, realtor.com launched a consumer-focused marketing campaign — with digital advertising and a series of videos on consumer websites like the New York Times and the Wall Street Journal — highlighting the accuracy and timeliness of its data relative to competing portals who don’t have the direct MLS feeds realtor.com does and thus suffer in those respects in some markets, as recent studies from brokerages ZipRealty and Redfin illustrate. Zillow’s betting that “advertising follows audience,” CEO Spencer Rascoff has said repeatedly in recent investor presentations. Rascoff told investors on the firm’s third-quarter earnings call that Zillow thinks that with its increasing consumer market dominance, the amount of money agents will spend on advertising will increase to the referral price range — up to 30 to 40 percent of an agent’s commission of a Zillow-fed deal. Trulia sees a different endgame — providing enterprise-level software and marketing solutions to agents. CEO Pete Flint said on its third-quarter earnings call that the company’s goal is to have 250,000 agents paying the portal an average of $450 a month for its services. What does this mean for agents, who are the main source of revenue for the big listing portals? “I’m not a fan of realtor.com,” said Matthew Difanis, a broker-owner of Re/Max Realty Associates in Champaign, Ill., who attended Samuelson’s talk. That opinion comes straight from experience. “My ROI (return on investment) is less on realtor.com than on Trulia and Zillow,” he said. In a mix of offense (paying to show up on other agents’ listings) and defense (paying to keep agents from appearing on his own), he buys about $1,500 worth of advertising on Trulia and about half that to advertise on Zillow. He spends about $300 per month on realtor.com’s Market Snapshot product and in six months says he has yet to close a lead he got from it. Difanis says he’s less concerned about realtor.com’s strategy than on seeing a better bottom-line result when he pays to get leads from the portal, but says he’s keeping a close eye on the portal for future advertising in the wake of Move’s mandate to operate it with more freedom.